Michael Wayne Plant’s work explores issues relating to capitalism and economics within the social landscape, that we all inhabit his with social documentary photography. New Zealand born, Michael Wayne Plant has lived and worked as a photographer in Australia, Greece, USA, Italy, France and the United Kingdom. As a photographer he has worked across a number of genres, these have all influenced his development, interests and aesthetic style as a photographer. He completed an MA in Photography and Urban Cultures at Goldsmiths College, University of London in 2008. Where he further developed his interest in making work that visualises aspects of capitalism, economics and the social landscape, by using both social documentary and street photography approaches to making images. Between 2008 and 2010, he completed a PGCE (Post Graduate Certificate in Education) from Canterbury Christchurch University, while setting up the accredited photography program at Adult Education College Bexley. In 2009, he became the Lead Photography Lecturer at Idea Store Learning in Tower Hamlets responsible for approximately 70 courses a year, from short 5 week courses to year long diploma and certificate courses. Leaving in 2017 to return to being a full time photographer. Michael is a X-Rite Coloratti Pro photographer, and he was a Sony Imaging Advocate and then Sony Global Imaging Ambassador, with Sony supporting his work between 2009 and 2017. He has been supported by Epson (printing & scanners), OnOne (software), Blurb (self published books). 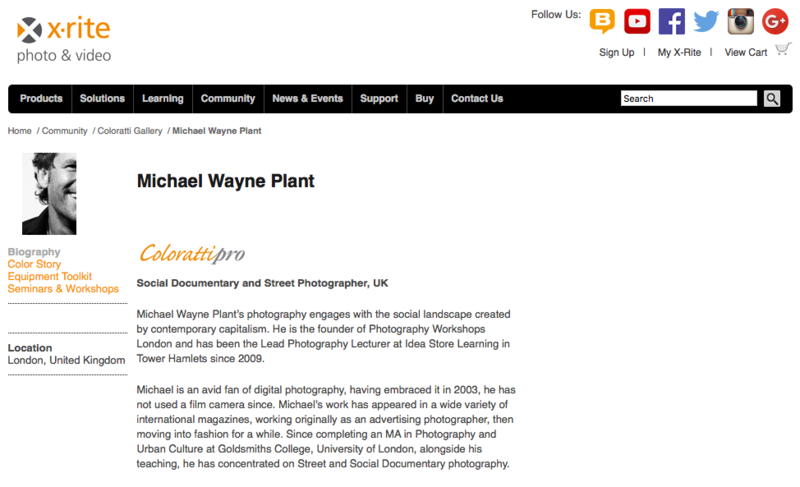 Michael Wayne Plant as featured on the X-Rite ColorattiPro photographer’s website. If you have a project you would like to collaborate on, Michael would love to hear from you.